How does EZ Snap’s shipping work? EZ Snap® provides FREE Shipping on all orders over $225. There are no additional customs or brokerage charges. Your shipping costs to Canada or the U.S.A. will be FREE, $9.95, $14.95, or $19.95, depending on the dollar size of your order. 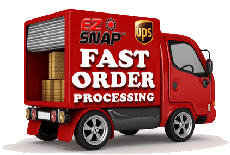 EZ Snap® has a proven track record of FAST order processing. We normally ship your order on the next business day after the order is placed. UPS Ground takes 4 to 8 business days to deliver to your door. When orders are shipped, an email is sent with a tracking number and link to our tracking page that shows the scheduled delivery date and the progress of each shipment. Can you explain EZ Snap’s warranty? Where can I find an EZ Snap® Dealer? EZ Snap® is only available at www.ezsnapdirect.com . We skip the middleman and sell at wholesale pricing, directly to our customers, through our online store or by phone at 1-877-4EZSNAP (1-877-439-7627 ). Our kits are designed for Do-It-Yourself installation, however, some of our customers hire a contractor or handyman to do the measuring and / or installation on site. How can I get some help with my EZ Snap® purchase? 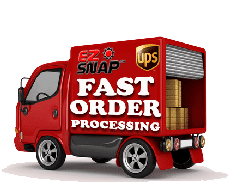 How do I order EZ Snap® products? How do Window Shades work? Installing EZ Snap® exterior Window Shades blocks the heat from the sun, before it enters the window. The magic happens by stopping the heat on the outside of the window, not on the inside. EZ Snap’s patented do-it-yourself system offers professional looking solar shades on vinyl or aluminum frame windows, without the need for drilling or screws. EZ Snap® exterior shades are up to 7 times more effective than traditional interior window treatments such as roller shades, pleated shades, blackout shades, or reflective sun shade materials. According to the U.S Dept of Energy. EZ Snap® Window Shades increase summer comfort inside and help to reduce the amount of energy required for air conditioning. How to measure for Window Shades? EZ Snap® Window Shades can be fastened to your window frames, window trim/casings, or the siding just beyond your window frames. If none of these options will work for you, Adhesive Fasteners can be installed directly onto the window glass, if necessary. Covering the whole width of your window trim/casing with Shade Mesh is more forgiving (should you have any crooked cuts) than partially covering your trim/casing. This is especially true if the trim color is a heavily contrasting color to the shading mesh, like black shading mesh over white trim. For shading mesh width A, measure from the center of left Fasteners, across glass, to the center of the right Fasteners, and add 1 to 2 inches. For shading mesh height B, measure from the center of top Fasteners, down across glass, to the center of the bottom Fasteners, and add 1 to 2 inches. Tips: Distance between the centre of each Pin to the outside edge of the Shade Mesh must be minimum 1/2 inch. If installing Shade Mesh on multiple windows, use the “Cookie Cutter” or “Tetris” method to nest your various window sizes into the 72 inch tall Shade Mesh. Windows can be rotated for the most efficient use of the EZ Snap® Shade Mesh with the least amount of waste. Tip: Measure twice, cut once. We recommend that you print out and complete the measuring guide to figure out the most efficient layout before you start cutting your Shade Mesh. Which snap fasteners are best for my project? Generally speaking, most customers prefer using the EZ Snap® 3M™ Adhesive Fasteners for their Window Shades. “No Holes to Drill, No Screws Required”. Deciding which EZ Snap® Fasteners are best for your Window Shades depends on the type of window frames you have. NOTE: If your window is 25 square feet or larger or you are in a high wind area, then use a maximum 5 inch spacing. If not, the standard spacing for Fasteners is a Maximum 10″ spacing. 3M™/Stainless Screw COMBO Snaps: 4 stud color available to match your mounting surface color | Self-tapping screws | 3M™ adhesive seals around screw hole. 3M™ Adhesive Snaps: No-drill, no-screw option | 4 stud color available to match your mounting surface color. For all Fastener types we recommend maximum 10 inch spacing on most windows. If your window is 25 square feet or larger or you are in a high wind area, then maximum 5 inch spacing. Stainless Steel Screw Fasteners come with self-tapping screws, making installation easy. Caution must be used when putting screws into window frames, making sure to avoid screw contact with glass inside of the window frames. Most commonly used for wooden window frames, siding or stucco mounting. 3M™ Adhesive Fasteners are 7/8 inch diameter and require a smooth, flat, clean surface at least 7/8 inch wide for mounting. Most commonly used for vinyl (rigid PVC) and aluminum window frames. How much do Window Shades cost? EZ Snap® exterior Window Shade prices vary, depending on the size of the windows. The length and height of Window Shades needed, along with the number of Fasteners selected, will determine your cost. All the Window Shade Kit sizes and prices are listed in our secure online store. If you don’t know what size kit you need for your windows and skylights, please see ‘How to measure for Window Shades’ above. How to install Window Shades? EZ Snap® Window Shades are installed on the outside of your windows and can be fastened to window frames, siding, stucco, or directly onto the window glass. EZ Snap® Window Shades are very durable and weatherproof material that does not require any special care. EZ Snap® Window Shades can be cleaned simply with water from a garden hose. For any dirt that doesn’t easily rinse off, warm soapy water may be used as needed. Window Shades can stay on year-round or be removed during cooler seasons. When removing your Window Shades, be sure to use the EZ Snap Removal Tool or a small flat screwdriver to separate the Fasteners. Place the straight blade between the base of the Pin and the Stud, twisting gently, to pop them apart without pulling on the Shades or the Fasteners. The Stud remains on the mounting surface and the Cap and Pin stay locked onto the shading mesh. Window Shades should be clean and dry when rolled up for storage. Shades will maintain their smooth, wrinkle-free appearance longer if folding or ‘kinking’ the Shade Material is avoided. With thousands of applications in Sun-Belt states, EZ Snap Shade Mesh has proven it is able to maintain its shading coefficient for a life expectancy of 10+ years. How do Skylight Shades work? How to measure for Skylight Shades? Exterior Skylight Shades can be fastened to your skylight frames, right next to the glass, or on the outside vertical part of the frame. Typically, you would cut the screen mesh 1/2″ oversized from the size of the skylight frame and then you would place the fasteners about 1/2″ to 3/4″ from the outside edges of the screen. Have a look at our skylight measuring instructions here for flat, domed, and pyramid-shaped skylights. If ordering Shade Mesh for 1 skylight, take the height and width of that skylight, then select the right kit from our online store here… Note: Skylight Shade Kits sizes are all 6 feet in one direction and the length of the kit in the other direction. For example: a 3 Foot Kit is 6 by 3 feet; a 5 Foot Kit is 6 by 5 feet; a 20 Foot Kit is 6 by 20 feet. If ordering Shade Mesh for multiple skylights, use the “Cookie Cutter” method to nest your various skylight sizes into the 6 foot width of the Shade Mesh. This method provides the most efficient use of the EZ Snap® Shade Mesh with the least amount of waste. For example: two 3 by 5 foot windows could fit in one 5 foot kit. The number of Fasteners required will be determined by the size of your skylights and whether or not you are in a High Wind area. Fastener spacing is maximum 10 inches unless your skylights are over 25 square feet or if you are in a High Wind area, then maximum spacing drops to a 5 inch spacing between fasteners. Tip: We recommend that you print out the measuring guide and fill it in to figure out which kit you need. Your completed guide will also be helpful when it’s time to cut your Shade Mesh to fit your skylights. When covering multiple windows and skylights, it’s important to use the washable layout pencil to mark your layout on the Shade Mesh before you start cutting. Measure twice, cut once. Generally speaking, most customers prefer using the EZ Snap® 3M™ Adhesive Fasteners for their skylight Shades. “No Holes to Drill, No Screws Required”. 3M Adhesive Fasteners are 7/8 inch diameter and require a smooth, flat, clean surface at least 7/8 inch wide for mounting. Most skylight frames have adequate space on the frames right next to the glass. If not, then mount the Adhesive Fasteners on the outside vertical part of the frame. How much do Skylight Shades cost? EZ Snap® exterior Skylight Shade prices vary, depending on the size of the skylights. The length and height of Skylight Shades needed, along with the number of Fasteners selected, will determine your cost. All the Skylight Shade Kit sizes and prices are listed in our secure online store. If you don’t know what size kit you need for your skylights, please see ‘How to measure for Skylight Shades’ above. How to install Skylight Shades? EZ Snap® Skylight Shades are installed on the outside of your skylights and can be fastened to the skylight frames or directly onto the window glass. Most skylight frames have adequate space to attach Adhesive Fasteners on the frames right next to the glass. If not, then mount the Adhesive Fasteners on the outside vertical part of the frame. EZ Snap® Skylight Shades are very durable and weatherproof material that does not require any special care. EZ Snap® Skylight Shades can be cleaned simply with water from a garden hose. For any dirt that doesn’t easily rinse off, warm soapy water may be used as needed. Skylight Shades can stay on year-round or be removed during cooler seasons. When removing your skylight blinds, be sure to use the EZ Snap Removal Tool or a small flat screwdriver to separate the Fasteners. Place the straight blade between the base of the Pin and the Stud, twisting gently, to pop them apart without pulling on the Shades or the Fasteners. The stud remains on the mounting and the Cap and Pin stay locked onto the shading mesh. Skylight Shades should be clean and dry when rolled up for storage. Shades will maintain their smooth, wrinkle-free appearance longer if folding or ‘kinking’ the Shade Material is avoided. How do EZ Snap® Yacht Window Shades work? How to measure your yacht or boat for Window Shades? Generally speaking, most customers prefer using the EZ Snap® 3M™ Adhesive Fasteners for their yacht Shades. “No Holes to Drill, No Screws Required”. NOTE: If your boat window is 25 square feet or larger or you are in a high wind area, then use a maximum 5 inch spacing. If not, the standard spacing for 3M Adhesive Fasteners is a Maximum 10″ spacing. How much do EZ Snap® Yacht Shades cost? EZ Snap® Yacht Window Shade prices vary, depending on the size of the windows and fastener type you choose. The length and height of boat Shades needed, along with the number of Fasteners selected, will determine your cost. All the Yacht Window Shade Kit sizes and prices are listed in our secure online store. If you don’t know what size kit you need for your boats windows, please see ‘How to measure your boat for Window Shades’ above. How to install Exterior Yacht Shades? EZ Snap® yacht Shades are installed on the outside of your vessels windows and can be fastened to the side of your boat (just beyond the edge of the window) or directly onto the window glass. Care & Usage of your Yacht shades. EZ Snap® Yacht Shades and blinds are very durable and weatherproof material that does not require any special care. EZ Snap® boat Shades can be cleaned simply with water from a garden hose. For any dirt that doesn’t easily rinse off, warm soapy water may be used as needed. Yacht Shades should be removed from the vessel before travel. If a Shade were to detach during travel, it could be lost. Even worse, the shade could impair your vision enough to cause an accident (possible liability). When removing your RV Shades, be sure to use the EZ Snap Removal Tool or a small flat blade screwdriver to separate the Fasteners. Place the straight blade between the base of the Pin and the Stud, twisting gently, to pop them apart without pulling on the Shades or the Fasteners. The stud remains on the RV and the Cap and Pin stay locked onto the shading mesh. Boat Shades should be clean and dry when rolled up for storage. Shades will maintain their smooth, wrinkle-free appearance longer if folding or ‘kinking’ the Shade Material is avoided. How do EZ Snap® RV Window Shades work? How to measure your RV for Window Shades? Exterior Window Shades are ideally fastened to the side of your RV (just beyond the edge of the window frame). Shades can also be mounted directly onto the window glass, if necessary. 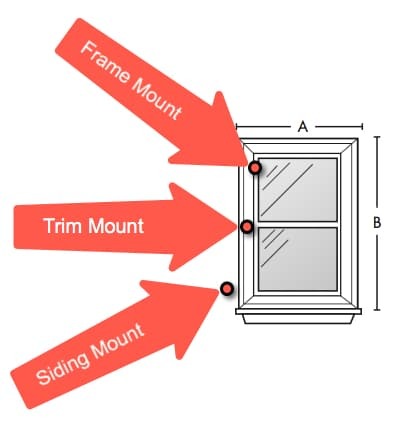 When measuring your windows, go from the centre of the Fastener position on the left, across the window, to the centre of the Fastener position on the right, and add 2 inches. Repeat, measuring from the Fastener position on the top, down across the window, to the Fastener position on the bottom, and add 2 inches. If ordering Shade Mesh for 1 window, take the height and width of that window, then select the right kit from our online store here… Note: Window Shade Kits sizes are all 6 feet in one direction and the length of the kit in the other direction. For example: a 3 Foot Kit is 6 by 3 feet; a 5 Foot Kit is 6 by 5 feet; a 20 Foot Kit is 6 by 20 feet. If ordering Shade Mesh for multiple windows, use the “Cookie Cutter” method to nest your various window sizes into the 6 foot width of the Shade Mesh. This method provides the most efficient use of the EZ Snap® Shade Mesh with the least amount of waste. For example: two 3 by 5 foot windows could fit in one 5 foot kit. The number of Fasteners required will be determined by the size of your windows and wether or not you are in a High Wind area. Fastener spacing is maximum 10 inches unless your windows are over 25 square feet or if you are in a High Wind area, then maximum spacing drops to a 5 inch spacing between fasteners. Tip: We recommend that you print our measuring guide and fill it in to figure out which kit you need. Your completed guide will also be helpful when it’s time to cut your Shade Mesh to fit your RV windows and skylights. When covering multiple windows and skylights, it’s important to use the washable layout pencil to mark your layout on the Shade Mesh before you start cutting. Measure twice, cut once. Generally speaking, most customers prefer using the EZ Snap® 3M™ Adhesive Fasteners for their RV Shades. “No Holes to Drill, No Screws Required”. NOTE: If your RV window is 25 square feet or larger or you are in a high wind area, then use a maximum 5 inch spacing. If not, the standard spacing for 3M Adhesive Fasteners is a Maximum 10″ spacing. How much do RV Shades cost? EZ Snap® RV Window Shade prices vary, depending on the size of the windows and fastener type you choose. The length and height of RV Shades needed, along with the number of Fasteners selected, will determine your cost. All the RV Window Shade Kit sizes and prices are listed in our secure online store. If you don’t know what size kit you need for your RV windows and skylights, please see ‘How to measure your RV for Window Shades’ above. How to install RV Shades? EZ Snap® RV Shades are very durable and weatherproof material that does not require any special care. EZ Snap® RV Shades can be cleaned simply with water from a garden hose. For any dirt that doesn’t easily rinse off, warm soapy water may be used as needed. RV Shades must be removed before travel because highway speed wind whip may prematurely wear out the fabric. Also, if a Shade were to detach during travel, it could be lost. Even worse, the flying shade could land on the windshield of the car behind you (possible liability). When removing your RV Shades, be sure to use the EZ Snap Removal Tool or a small flat blade screwdriver to separate the Fasteners. Place the straight blade between the base of the Pin and the Stud, twisting gently, to pop them apart without pulling on the Shades or the Fasteners. The stud remains on the RV and the Cap and Pin stay locked onto the shading mesh. RV Shades should be clean and dry when rolled up for storage. Shades will maintain their smooth, wrinkle-free appearance longer if folding or ‘kinking’ the Shade Material is avoided. RV Shades must be removed before travel because highway speed wind whip may prematurely wear out the fabric. Also, if a Shade were to detach during travel, it could be lost. Even worse, the flying shade could land on the windshield of the car behind you (possible liability). When removing your RV Shades, be sure to use the EZ Snap Removal Tool or a small flat blade screwdriver to separate the Fasteners. Place the straight blade between the base of the Pin and the Stud, twisting gently, to pop them apart without pulling on the Shades or the Fasteners. The stud remains on the RV and the Cap and Pin stay locked onto the shading mesh. How does RV Skirting work? RV Skirting encloses the open space between the sides of your RV and the ground and works as a barrier to cold temperatures, wind, and snow. This keeps the warm air in and the cold air out. RV Skirting also increases winter comfort inside your RV and helps to reduce the amount of propane or electricity required for heating. How to measure your RV for Skirting? The calculator will give you a quick estimate of which size kit will fit your RV, then you can check the prices for the recommended kit. Please keep in mind that you will need to measure before your order to make sure you order the right length and height of RV Skirting for your rig. Length: Measure the entire perimeter of your RV, including the front and back, as well as any slide outs you plan to skirt. Deciding which EZ Snap® Fasteners are best for your RV Skirting depends on your personal preference and the temperature when you are doing the installation. Stainless Steel Screw Snaps: Maximum 10 inch spacing | Shiny silver in color | Self-tapping screws. 3M™/Stainless Screw COMBO Snaps: Maximum 10 inch spacing | 4 stud color available to match your mounting surface color | Self-tapping screws | 3M™ adhesive seals around screw hole. 3M™ Adhesive Snaps: Maximum 5 inch spacing | No-drill, no-screw option | 4 stud color available to match your mounting surface color. How much does RV Skirting cost? You will enjoy significant savings by ordering your RV Skirting directly from EZ Snap® and installing it yourself. Your specific cost will depend on the length and height of RV Skirting your rig requires, along with the type of Fasteners needed. All the RV Skirting Kit sizes and prices are listed in our secure online store. How to install RV Skirting? Traditional RV Skirting installed by custom upholstery shops is an expensive and time consuming process. This type of RV Skirting requires specialized tools, knowledge and experience. EZ Snap® Diamond Weave™ RV Skirting is a very durable and weatherproof material that does not require any special care. Cleaning is simply done with warm soapy water and a garden hose. Securing the bottom edge of your installed RV Skirting is VERY IMPORTANT. We recommend using a plastic pipe frame along with the EZ Snap® pipe clamps. Placing sandbags (or similar) behind the skirting keeps the pipe frame in place and helps protect against wind damage. This technique will extend the life of 3M™ Adhesive Fasteners as well by lessening the force on the fasteners. When removing your RV Skirting, be sure to use the EZ Snap Removal Tool or a small straight blade screwdriver to separate the Fasteners. Place the straight blade between the base of the Pin and Stud, twisting gently, to pop them apart without pulling on the Skirting or the Fasteners. The studs remain on the RV and the cap and pin remain locked together on the skirting. RV Skirting should be clean and dry when rolled up for storage. With thousands of applications in harsh winter environments, EZ Snap RV Skirting has proven a useful life expectancy of 6 to 8 years.